9 Commercial Real Estate & Properties in Miami are listed in 6 categories. We have 2 Industrial Warehouses Sale & Lease , 2 OfficesSale & Lease , 2 Hotels and LeisureSale & Lease , 1 Retail ShopsSale & Lease , 1 Development LandsSale & Lease and 1 ShowroomsSale & Lease . Experienced storage shed operators or investors looking for high yielding investment which requires minimal effort, this is the property for you. The property is located in one of the Gold Coasts most tightly held precincts in Miami. Situated on a 1,219 square metre block of land and is improved with a Storage Shed Facility. The property is being sold on a 'walk in, walk out basis'. The improvements comprise: 51 Storage Sheds trading at 100% occupancy Modern Caretakers Residence Modern 4 Bedroom Residence Managers Office Contact Tony Grbcic or Adam Grbcic for more information today. 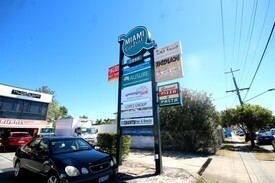 A wonderful opportunity to buy in the tightly held commercial precinct of Miami. Freehold land parcel Approx 240m2 building with a large mezzanine 4 car parking bays Roller door access Undercover security entrance Male and female amenities Freehold opportunities in this price range are rare, and this property won't last long. The property has significant street appeal and exposure to Paradise Ave and is surrounded by well know business such as Miami Marketta, KFC, Shell and is within walking distance to Nobby's Beach café and bar district, Burleigh Golf Club and The Gold Coast Hwy. $845,000 + GST Contact exclusive marketing agent Adam Young for more information or to arrange an inspection Approx Disclaimer: Ray White has not independently checked any of the information we merely pass on. We make no comment on and give no warranty as to the accuracy of the information contained in this document which does not constitute all or any part of any offer or contract by the recipient. Prospective purchasers / lessees must rely on their own enquiries and should satisfy themselves as to the truth or accuracy of all information given by their own inspections, searches, inquiries, advices or as is otherwise necessary. No duty of care is assumed by Orchid Avenue Realty trading as Ray White Surfers Paradise Commercial divisions toward the recipient with regard to the use of this information and all information given is given without responsibility. Be Quick - These Don't Last Long! $1,272 per month + GST In..
41m2 1st Floor office Air conditioned carpeted Ample parking Great location Common amenities Self contained kitchenette Approx Disclaimer: Ray White has not independently checked any of the information we merely pass on. We make no comment on and give no warranty as to the accuracy of the information contained in this document which does not constitute all or any part of any offer or contract by the recipient. Prospective purchasers / lessees must rely on their own enquiries and should satisfy themselves as to the truth or accuracy of all information given by their own inspections, searches, inquiries, advices or as is otherwise necessary. No duty of care is assumed by Orchid Avenue Realty trading as Ray White Surfers Paradise Commercial divisions toward the recipient with regard to the use of this information and all information given is given without responsibility. This is a great first floor office space located in a popular mixed business property facing the Gold Coast Highway in Miami. The bright and airy office is ideal for many professional services and businesses and boasts good internal facilities including ducted air conditioning , Kitchen area enclosed offices and communal facilities. There is also parking provided onsite. Inspect this space early as we think it will lease quickly!